A most remarkable stone, which was undoubtedly, in olden time, used for the carrying out of some pagan rite…A very old person, formerly living in the vicinity, but now long dead, stated to the writer that children suffering from measles and other infant maladies were passed through the aperture for a cure. 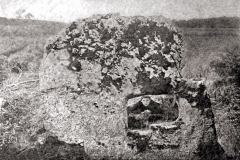 Without doubt most, if not indeed all of the ‘holed’…upright stones, as also the same class of crosses, were originally pagan pillar stones, which, owing to their hold on the primitive mind, were consecrated to the new worship, and still assert a powerful influence on the imagination of the peasant despite 1500 years of Christian effort. Drag within the image to see a close-up view of the Tobernaveen Holed Stone. 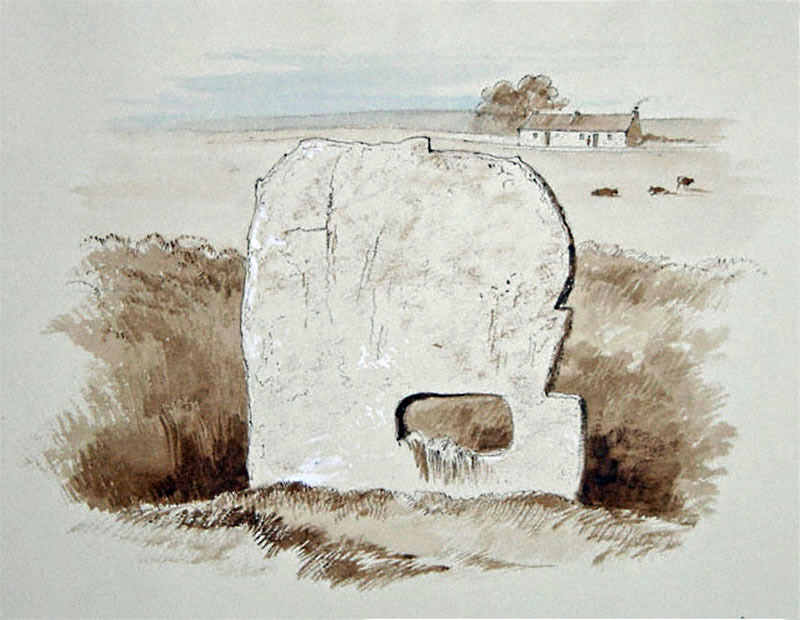 Early antiquarian writers who visited the stone, also called Cloch Bhreac (Speckled Stone) or Cloch Liath (Grey Stone), considered it to be set in place as a primitive boundary marker at the junction of three old parishes and three townlands. Starting with George Petrie in 1837 learned visitors noted its proximity to the megalithic necropolis and ceremonial center at Carrowmore, 2 km (1.25 mi) to the south, and speculated that it originated there.3 Some have guessed that the slab once served at Carrowmore as the “port-hole stone” of one of the many tombs, a way for the living to pass food and other tributes to their dead ancestors inhabiting the spirit world.4 Another standing stone with an aperture likely used in this manner may be found in Co. Carlow at the Aghade Holed Stone. In Co. Leitrim, the Corracloona Court Tomb’s porthole stone remains in place, an intact doorway to the burial cist. 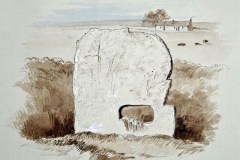 Patricia Curran Mulligan tells about a contemporary use of the holed stone for its reputed curative value (1999). But while Hutton may be correct in observing that the modern existence of a folk practice does not prove any connection to a similar practice in the distant past, neither should it exclude such a connection. There was a reported incident in that area where there was a child heard crying one night, and when it was investigated nothing could be found. It was a walker out who heard somebody crying. And the Gardaí arrived at my house just to confirm if my children had been down there in the fields that night. It was then that the historical aspect came to my mind. And I mentioned it to them, that could it be somebody who had an ill child? Someone who was familiar with the early writings about the particular stone and its curative purposes? And that they went to the site that night? 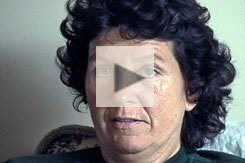 Patricia Curran Mulligan, Carrowmore, Co. Sligo. Recorded June 15, 1999. Click on the video, above right, to hear what this noted Sligo area artist discovered when she went down to the stone the next day. These parents must have been in a desperate need of a cure for their sick child to seek out the Tobernaveen Holed Stone in the dark of night. It’s enough of a trial to make a visit to this megalith in the bright light of the afternoon. It is in an overgrown field, crisscrossed by the rivulets of Tobar na bhFian (the Well of the Warriors).7 It is precarious enough just slogging forward, the “rattlin’ bog” nearly overtopping your Wellingtons. In addition, in order to approach the stone, it is necessary—while standing in the water—to step between the two wires of an electrified fence (seen in the background of the photo, top left). It is not advisable to walk in the water and pass through this electric fence while holding a tall metal camera tripod. If you were not in need of a cure from the Tobernaveen Holed Stone before doing so, you would most certainly need one afterwards.